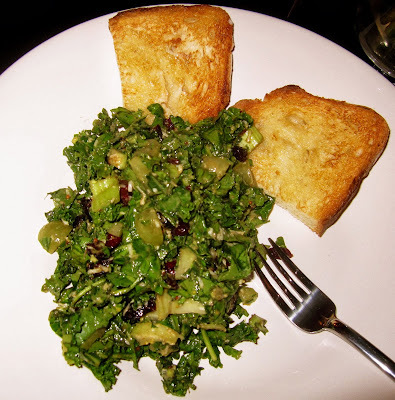 The two things that were my most favorite that came out of our kitchen in the last six weeks were a kale and brussels sprout salad and this one I'll share with you today. The brussels one is so, unbelievably delicious as well and I will share it with you another time but, for a quick, "we just got invited to a party that's TONIGHT and we need something easy" salad, this one is dressed to impress and takes all of 10 minutes to whip together. Pull out your prettiest serving bowl, big enough to toss your salad and add in the spinach, kale, celery, grapes and dried cranberries. In a Vitamix or food processor, blend the avocado, lemon juice, a drizzle of olive oil and some salt. Pour that over your greens, drizzle it with tahini and let it get chilled in the fridge while you mix up your dressing. Now just get out a jar or a plastic container, whatever you've got with a lid that can close tightly, put all the dressing ingredients in and shake until it's well mixed! Ta da! Dress your salad according to how you want it, we used probably a little more than half that amount on our salad for six, but taste and see how you like it. P.S. keep that yummy goodness in your fridge for a week if you want. And there you have the perfect party salad that's sure to please everyone.. even the ones who don't like living food.... c'mon, we all have friends like that, right??
" 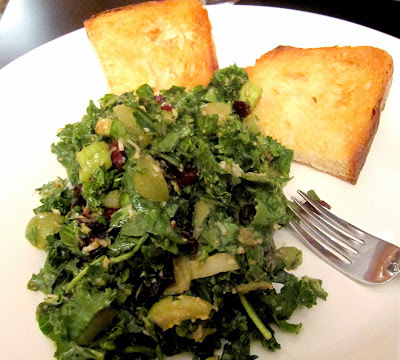 I HATE kale and I HATE spinach, but I LOVE this salad." Happy Tuesday, my dear foodie friends, and thanks for giving me grace while I was in Charlotte for so long. I just made this salad yesterday and it was yummy! I'm trying to put more greens into my diet and I loved adding the red grapes, it gave it that unexpected sweet taste. Thanks!